Benedict Cumberbatch to Star in Marvel's "Doctor Strange"! 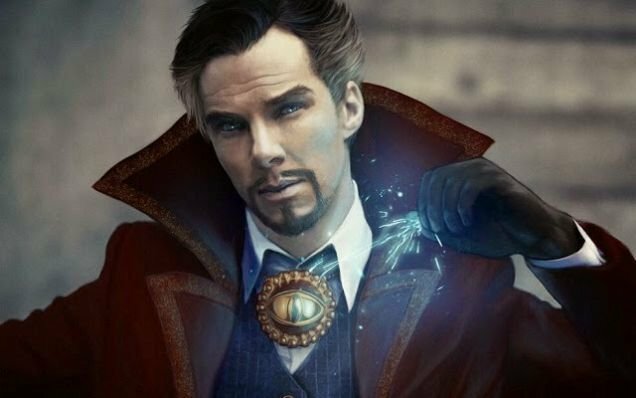 After months of rumors, Benedict Cumberbatch has officially entered negotiations to take the lead role in Marvel's upcoming "Doctor Strange" film, which is set to hit theaters on July 8th, 2016. Some of Hollywood's biggest names have been mentioned for the role, including Joaquin Phoenix, Ryan Gosling, Jared Leto, Tom Hardy, Justin Theroux, Ethan Hawke and Keanu Reeves. Marvel actually made an offer to Phoenix, but he rejected it after realizing that the contract would be multi-picture. "Doctor Strange" will be directed by Scott Derrickson (Sinister, Deliver Us From Evil, The Day the Earth Stood Still) and centers on a former neurosurgeon who serves as the primary protector of Earth against magical and mystical threats. Dance for Mickey Mouse you whore!! Dance!! disney hired a gay person? Sherlock, I get, but not Doctor Strange. Going to be quite weird to see this guy in that character after seeing him in as Khan, which wasn't him, and Sherlock, which is him all the way. "Marvel actually made an offer to Phoenix, but he rejected it after realizing that the contract would be multi-picture." OMG, the chance to star in not one, but perhaps several big-budget high-paying very visible simmer tent poles. The thought of actually working for for a living without making a fool of himself must have terrified him to know end. Just think: he might have eventually had enough money to fix that ravine on his face. Oh, and I like Cuumberbatch, but only as Sherlock. He seems to not fit pretty much every other role for some reason.Just something about his look and personality that draws me out of every performance he gives. The Khan one was the most egregious. He's not my first choice but I can dig it. Stfu fake f*cking Minkowski. You bullsh*t bad spelling c*nt! B-c*m IS LOVE. B-c*m IS LIFE. Best casting choice by Marvel since RDJ in my opinion! Although it would have been so f*cking sweet to see Phoenix's portrayal, I know c*mBY will deliver! He'll do. Curious how they will introduce spellcasting in to the MCU. I feel like Thor will somehow mix into it since Thor's universe involves a between of science and magic so it's a transition to fill magic. Okay, I could see c*mberbitch as Doctor Strangle .... It's the modern equivalent of hiring Christopher Lee to play Blacula.